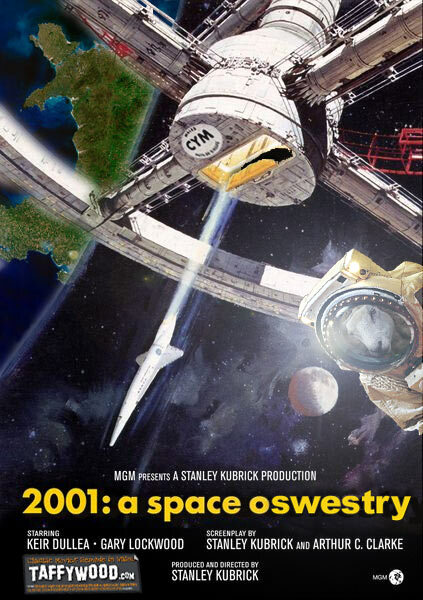 Welshification Explained | The Full List | The Dai Vinci Coed | Gallery | Taffywood Cards | I Loves The 'Diff | Suggest! 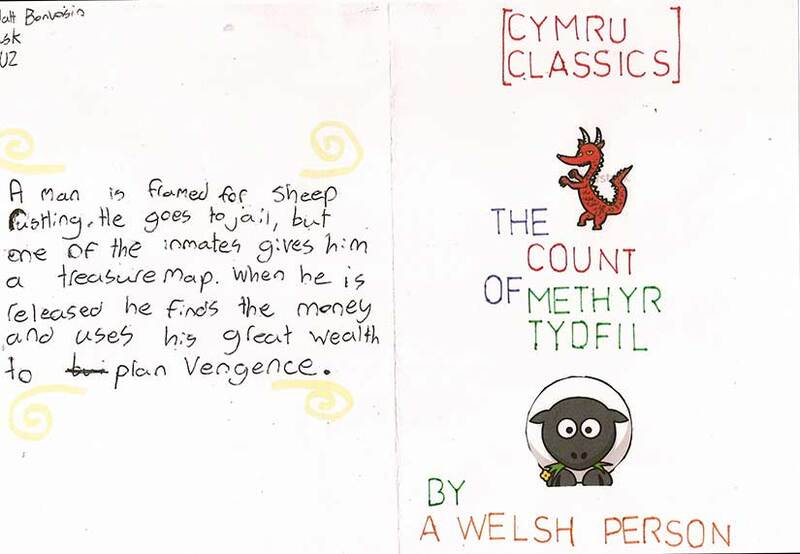 Ahead of their St David's Day Eisteddfod, pupils from Chepstow Comprehensive School were asked by their teachers to come up with their own Taffywood classics, complete with artwork and a synopsis. As you can see, they did a great job. 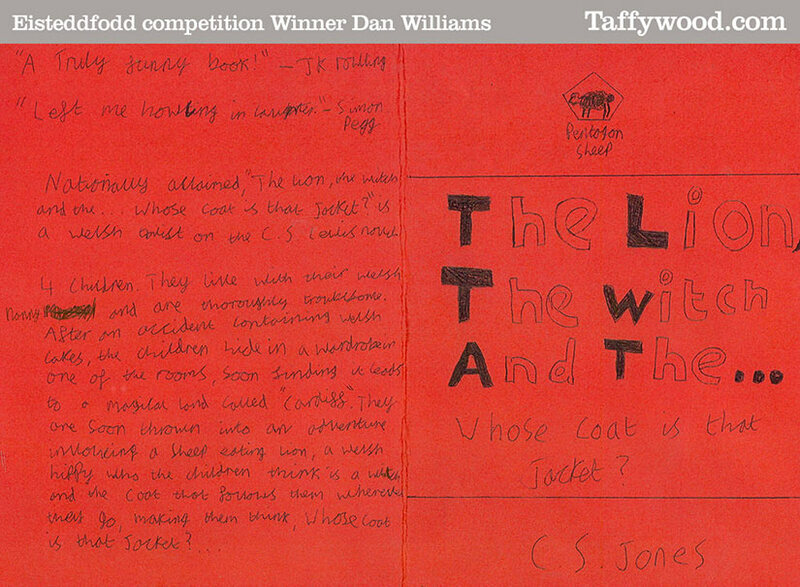 The winning entry was by Dan Williams for The Lion, The Witch, And The... Whose Coat Is That Jacket? 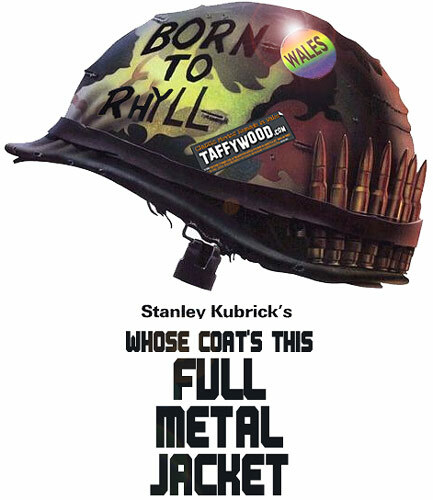 Featuring "an accident containing Welsh cakes", a hippy who is mistaken for a witch, and a ghostly coat, Dan is a worthy winner. We particularly liked his Pentagon Sheep publishing logo. Matt Bonvoisin for The Count Of Merthyr Tydfil - a gripping thriller about the revenge of a man wrongly imprisoned for sheep rustling(!). 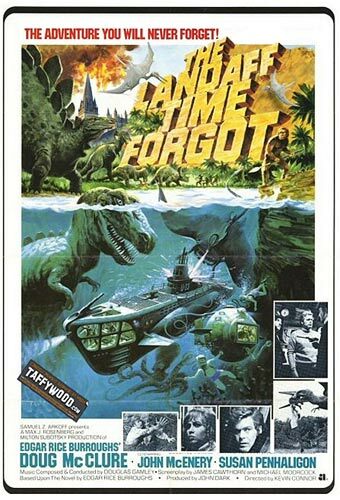 Megan Stewart - The Llandaff Time Forgot. 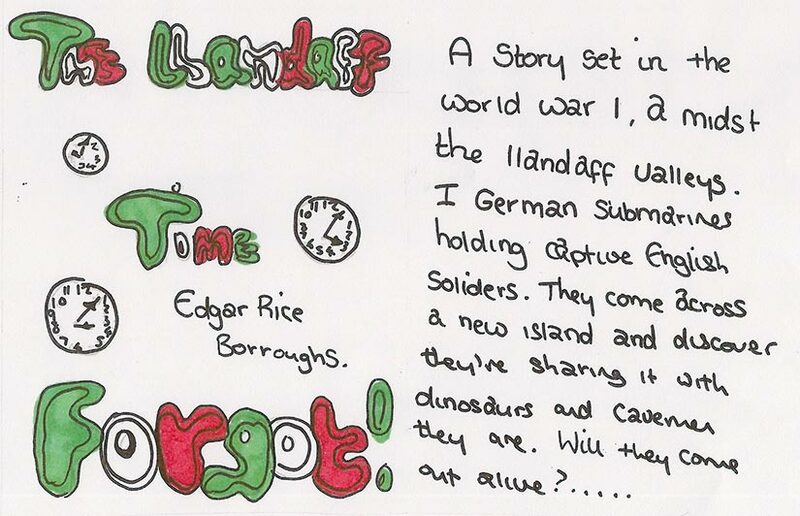 World War One soldiers discover a land of dinosaurs, possibly Wales. 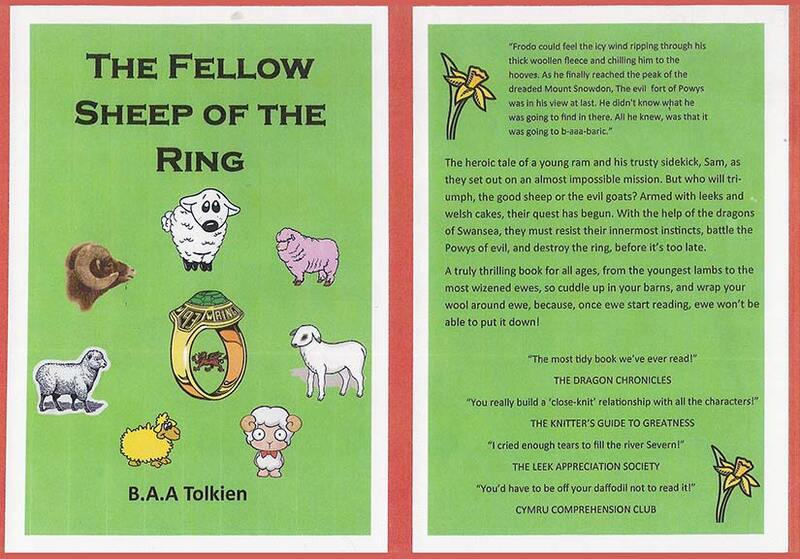 Erin McInnes - The Fellow-sheep Of The Ring - the "baaah-baric" tale by BAA Tolkien of a young ram's batttle with the Powys of Evil armed only with leeks and Welsh cakes. Brilliant ideas and artwork! Congratulations to Dan and the three runners-up for their great work for which they received Taffywood goodies (assuming the teachers didn't make off with them!). 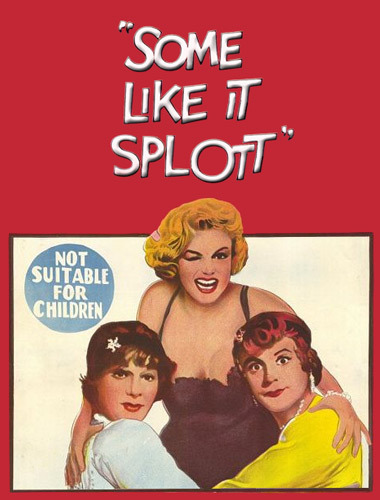 Check out their work below. 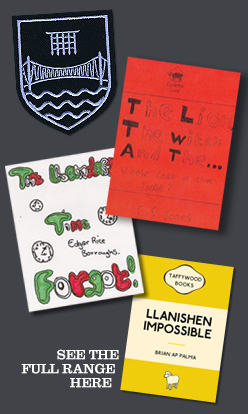 Last year Cardiff High School ran a competiton to find Taffywood titles among its year 7 students and we went along (nervously) on St David's Day to present the winners with prizes. One of the winners, Maggie, came up Llanishen Impossible, which was so brilliant that it joined our card and mug range. © Copyright 2013 Tiger Bay Trading Ltd.. All rights reserved. 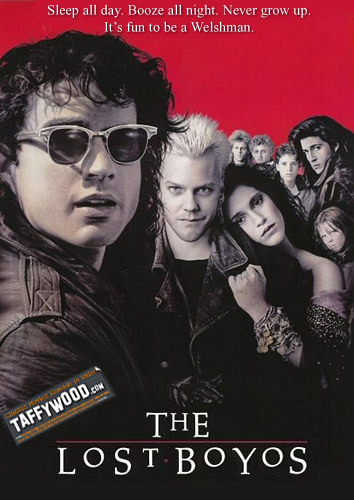 Taffywood and I Loves The 'Diff are trading names of Tiger Bay Trading Ltd.